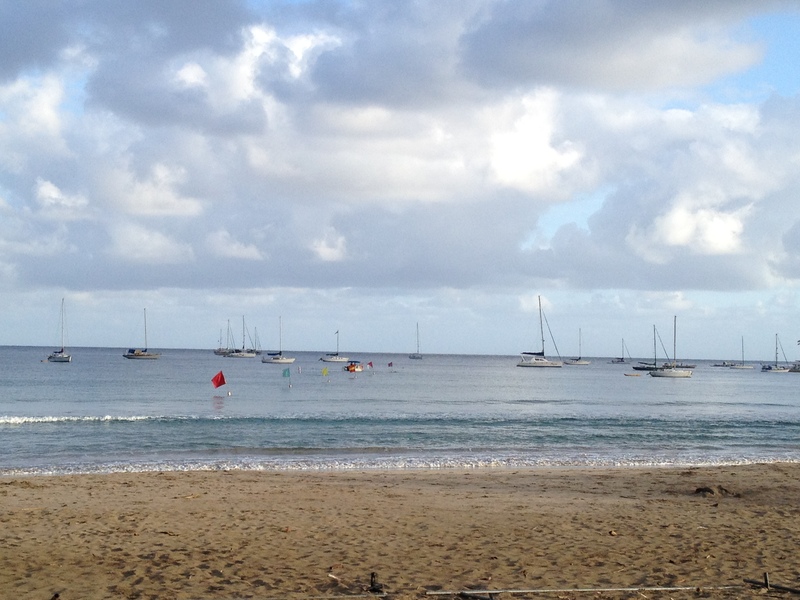 The outrigger canoe race season is in full fling. 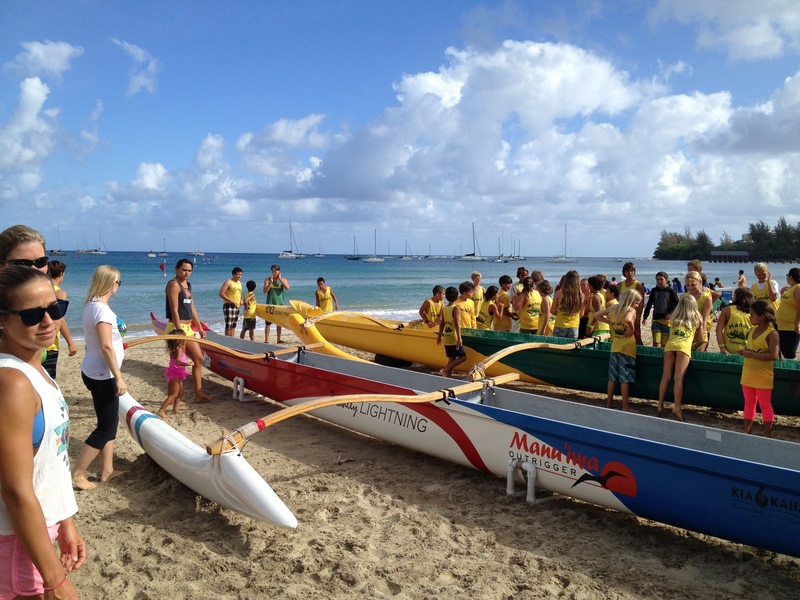 This weekend the Hanalei Canoe Club (HCC) participated in our second regatta of the season. Like the first, it was held in our beautfiul Hanalei Bay. It’s a great day out for the entire family, with kids’ races all morning, and adults’ all afternoon. Setup on race days starts at 7am. I try to get there early to enjoy the tranquility and grab a few morning photos before the hoards arrive. We gather at the Hanalei Pavilion beach park, and both park and beach are quickly buried under tents and bodies. 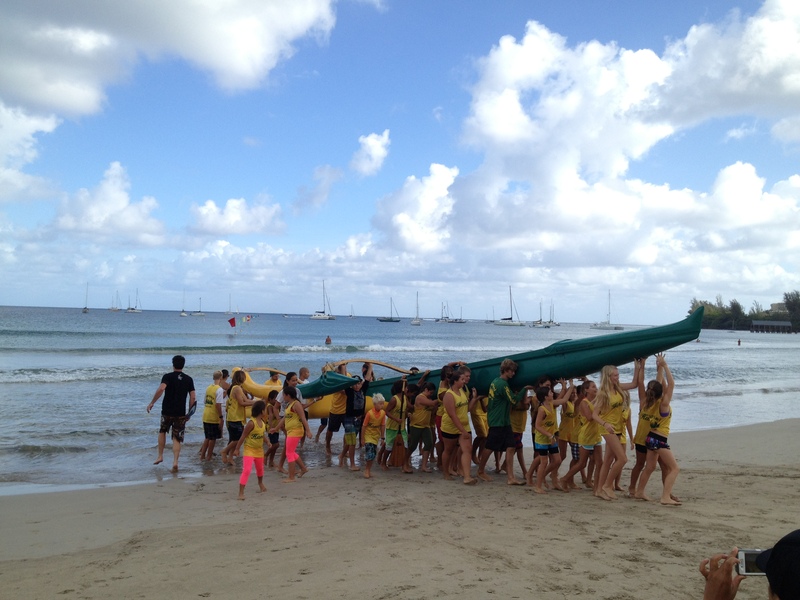 Our clubhouse is located on the edge of Hanalei River, close to the river mouth at the east end of the Bay, so it’s easy to paddle our canoes from the club to the Pavilion early in the morning, where the kids enjoy helping to haul them out onto the beach. 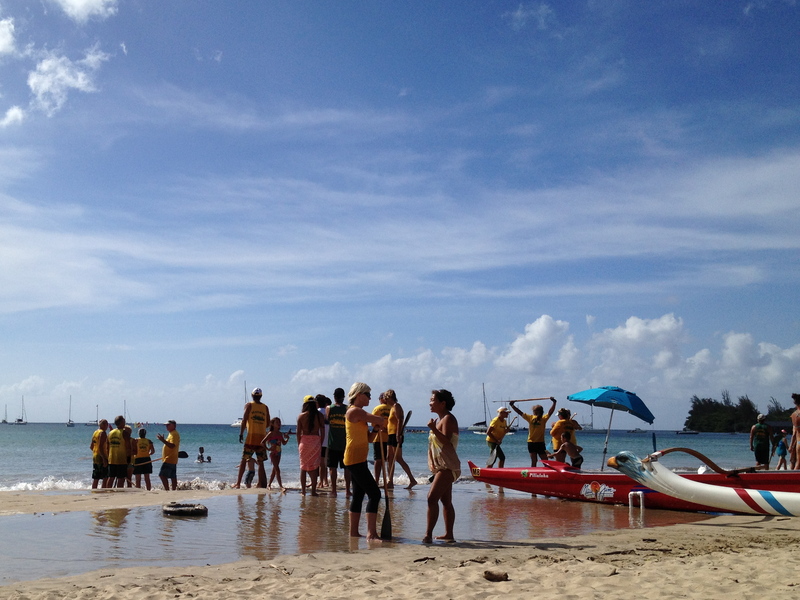 At the beginning of each regatta the Hanalei Canoe Club tradition is to form a circle around our canoes for an opening blessing, and usually the club song, Queen’s Jubilee. However, Devin our master ukulele player and honorary ‘musical director’ was MIA this weekend, so no song. It’s not easy to remember the Hawaiian lyrics, so I found a recording (there are plenty of them!) on YouTube to help me get it into my head for future events. As a Brit, I was interested to learn the story behind the song, which was written by Queen Lili’uokalani after traveling to London as a young princess with a large Hawaiian contingent to attend Queen Victoria’s Golden Jubilee. All the club members help at various stages, in various roles during the day. Everyone brings food to share; paddlers are a hungry crowd, and the food table quickly looks as if it’s been attacked by a flock of vultures, so we try to stagger the ‘unveiling’ of dishes to make them last a little longer. 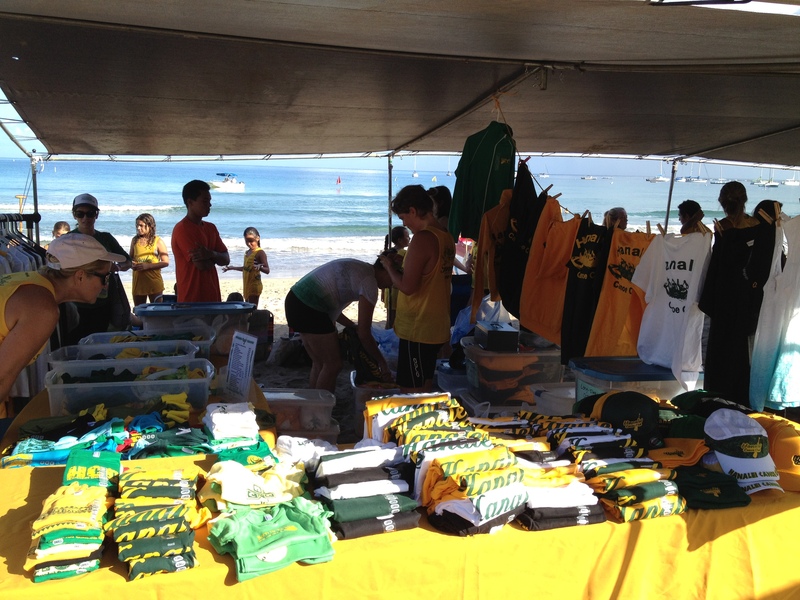 At every regatta, and other events too, we sell club merchandise to visitors and club members, which helps raise much needed funds for the club. It takes a large number of helpers to set up and unpack, to man the tables all day, and then to pack up at the end of the event. 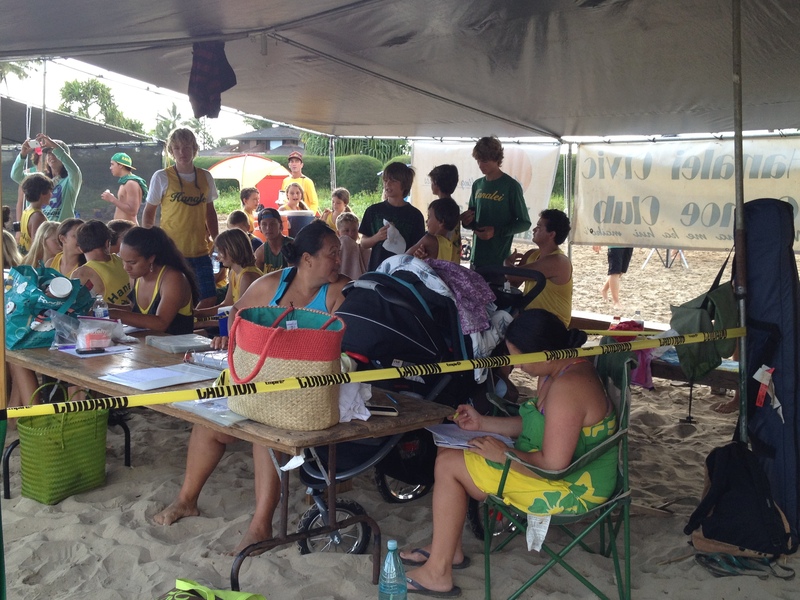 Each club also provides one or two members to work in the official race tent, recording results and timings. I’ve done a stint in the tent at both regattas so far, and it’s interesting to learn how it all comes together. Besides the official tent, we have our own club Mission Control, where the teams for each race are selected and race results monitored. This week, our extraordinary coach Lilinoe was ‘on duty’ as usual, from first thing in the morning, with baby Kaleb beside her, despite them both having experienced a C-section delivery 12 days previously. That’s Lilinoe below, busy at work in the yellow/green sarong, and Kaleb’s hidden in the buggy. She even showed up at the club with Kaleb when he was just four days old. She’s one tough cookie! We were blessed, again, with gorgeous weather and ocean conditions; yet another glorious day of paddling and camaraderie in the Bay. 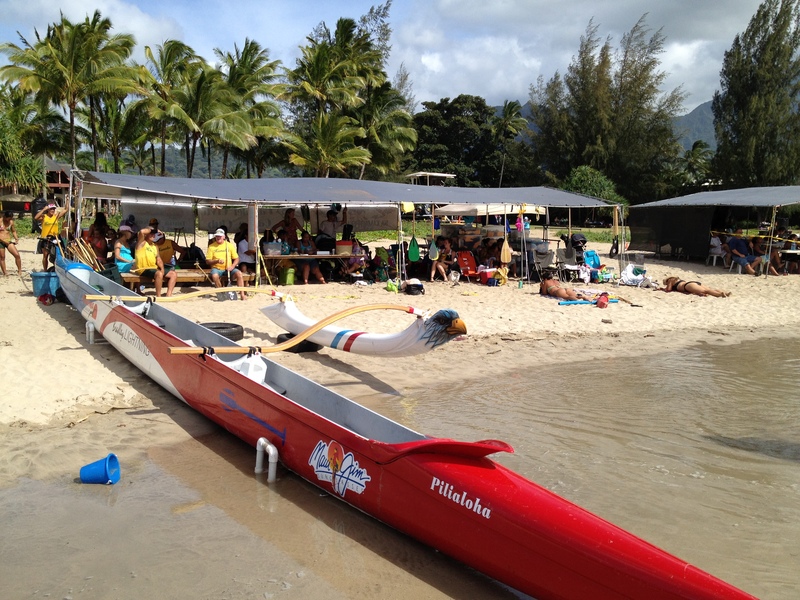 This year the Hawaiian Island Canoe Racing Association (HICRA) State Races will be held in Hanalei Bay on August 3rd. It will be an especially fun occasion for us all at HCC, as the State Races are only held here on our home turf in our home surf once every six years. The event is held on O’ahu every other year, and on a neighbor island other years. This entry was posted in Beaches, Hawaii, Kauai, Sports and tagged Hanalei Bay, Hanalei Canoe Club, HICRA, Kauai, outrigger canoe, Queen's Jubilee by kauaigreenhorn. Bookmark the permalink. Shirts received! These shirts are chock-a-block full of Aloha. Beth and I are already paddling better – deeper strokes, strong synchrony. I cannot recommend Hanalei Canoe Club shirts highly enough for those who enjoy or wear shirts. How can i order some of these shirts? I have two and they are getting old (purchased in 2006 & 2010) Please let me know! Aloha Colbe. Glad you’ve been enjoying your shirts for so long. You can try contacting the club at http://hanaleicanoeclub.org/pages/contact.php, with a description of the color/style/size of shirts you have/want.